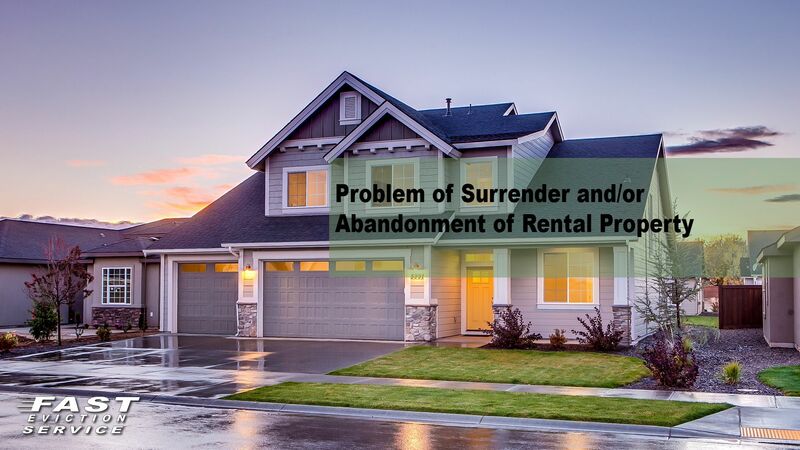 During the course of a landlord tenant relationship the issue of whether a tenant has legally surrendered the rental unit or abandoned the rental unit frequently arises. This article will expose those questions in light of obtaining possession of the rental unit only. Tenants may validly terminate their tenancy, extinguishing the obligation to pay rent, by making a written offer to surrender that is accepted in writing by the landlord – as a lease can be terminated by mutual consent of both parties. In such an event, an Unlawful Detainer may be commenced if the tenant, without the landlord’s permission, fails to give up possession at the agreed-upon time. If this stipulation was signed by the landlord and tenants stating that the tenants “agree to vacate and surrender complete possession of the subject premises” so the landlord can complete repairs, this does not show an objective intention to award permanent possession to the landlord – or constitute a waiver of the tenants’ right to reoccupy premises under local rent stabilization ordinances . A “surrender” is a two-sided consensual termination of the tenancy. Thus, tenants ordinarily cannot avoid their lease obligations by a unilateral unaccepted offer to terminate early. Surrender had far greater significance prior to the adoption of the statutory “abandonment” procedure. Under current California law, tenants can, in effect, initiate a “unilateral” termination of their tenancies by “abandoning” the premise. If the landlord properly acts to “establish” the abandonment – thus giving him or her the right to reenter and rerent the premises – both the tenancy and the abandoning tenant’s obligations under the lease are extinguished. But, absent any contrary provision in the lease, the landlord will usually be able to recover some portion of the unpaid rent in damages with the alternative remedy of electing to continue abandoning the tenant’s lease, if specifically permitted by the lease, and suing for rent as it accrues. Case Example: A tenant has executed a two year residential lease and wants to vacate one year into the lease. The tenant sends a Notice of Intent to vacate 13 months into the lease. What should the landlord do? Send a response to the tenant advising him or her that the landlord will not accept the tenants request to vacate in order to preserve rights to sue for damages for early termination of the lease. Remind the tenant that they are obligated under the terms of the lease. Case Example 2. Tenant sends a 30 Day Notice of his or her intent to vacate the rental property in a month to month rental agreement. The tenant fails to vacate and does not turn in the keys after the expiration of the Notice. The landlord should immediately file an Unlawful Detainer case after the expiration of the tenant’s notice. Do not accept any further rent as the acceptance of that rent would create a new month-to-month term. Case Example 3 -Tenant leaves the rental property without turning in the keys. The landlord should immediately serve a 24 Hour Notice of Intent to Enter the Premises to determine if the tenant has vacated. Make sure the rental unit is properly secured and do not change the locks. We do not recommend that the landlord serve a Notice of Abandonment under this circumstance because if the landlord is wrong the landlord can be exposed to serious monetary damages for wrongful eviction. What Is A Notice Of Abandonment And When Can It Be Served?